Place the eggs in a metal pot. Whisk in the sugar until combined. is warm, that of baby’s milk. Remove from heat and transfer the mixture into a mixing bowl. Whip until the mixture has tripled in volume and is thick and rich. while, before merging with the mixture. There shouldn't be any flour pockets visible and do not over-mix. has been incorporated into the cake batter. Pour the mixture back into the cake batter and fold it in gently. Transfer the cake batter into the sheet pan. to burst the uneven air bubbles. and a skewer inserted into the center of the cake comes out dry. While the cake is baking, sprinkle a clean tea towel with granulated / caster sugar. When the cake is done, remove it from the oven and set it aside for 1 minute. Turn the sponge out onto the tea towel with sugar. Roll up the cake firmly from the shorter end and set it aside to cool completely. Place the dark chocolate in a heatproof bowl. the bottom of the heatproof bowl. Stir the chocolate occasionally until all the chocolate has melted. seconds, until the chocolate looks shiny. Stir the chocolate until all has melted, heating it if needed. Leave the bowl of chocolate aside to cool to room temperature, stirring occasionally. Place the egg whites in a different heatproof bowl. Use a whisk and whisk the egg whites, adding the sugar in 3 batches. Remove the egg whites mixture from the heat. had cooled down completely and the mixture is thick and glossy (stiff peaks). The egg whites will not slide even when the bowl is overturned. Beat in the unsalted butter cube by cube. The mixture will become very watery and seems like the butter cream has failed. make sure it’s completely cooled!). Beat with the electric mixer on low speed until fully incorporated. Unroll the cooled Swiss roll. Spread an even layer of Peanut Butter cream on the Swiss roll and roll it up to form a log. Cut out a short section of the Swiss roll at a diagonal to from the branch. remaining section of the Swiss roll. 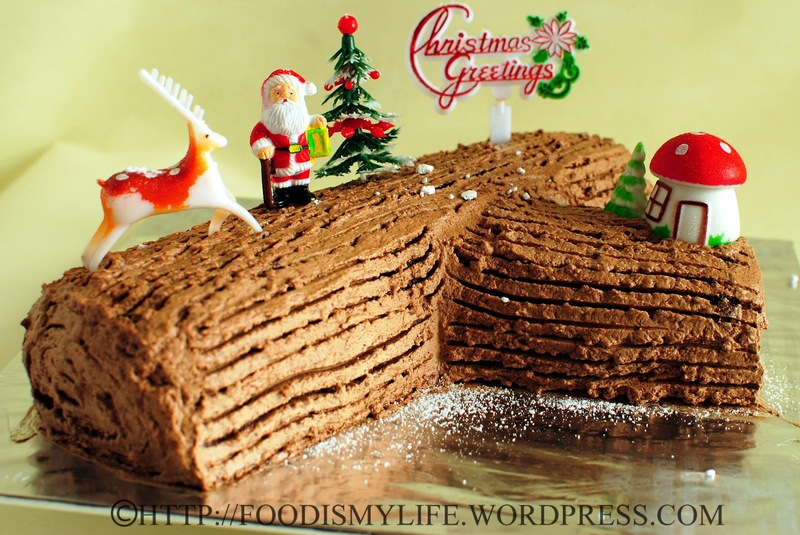 Spread a thin layer of Chocolate Meringue Butter cream all over the log cake. Refrigerate it for 10 minutes. Spread an even layer of the remaining Chocolate Meringue Butter cream all over the log cake.